Jonathan Thompson is the author of River of Lost Souls, which tells the story behind the 2015 Gold King Mine disaster that turned the Animas River in southwestern Colorado orange with sludge. If you’re an avid birder or just starting out, it doesn’t get much better than this! Three days/two nights on the Colorado River through Ruby and Horsethief canyons with expert birding guides and local food and wine. Make your reservation today - only 60 seats available! Join some of the Grand Valley’s cadre of paleontologists as we take you down the Colorado River. You’ll hike, camp, and search for fossils where few have done so before! Will you make the next big find? Colorado’s oldest house is right in our backyard at the Eagle Rock Shelter. Join Dr. John Seebach and the CCA crew as we take in the fall leaves and historic sites along the Gunnison River. Ready to try the waters? Time to dip your line into the Gunnison River and learn how to fly fish, like you’ve been wanting to. Join CCA and partners for this fun day! Come with CCA’s Education Director and nationally-renowned paleontologist, Rob Gay, as we float the Colorado River and learn about the deep-time history of McInnis Canyons NCA. When it comes to "leaving no trace" our pups need some help, so to celebrate Earth Day, that's what we're gonna give 'em! Learn about the formation of the Uncompaghre Plateau from BLM geologist Eric Eckberg. Hike deep into the wilderness in Dominguez Canyon to see the traces that the Fremont, Utes, and others have left behind. Come join us at our inaugural volunteer orientation! You’ll learn more about CCA and how you can help us get thousands of kids outdoors, restore the amazing public lands that surround us, or just help us with general things around the office! Learn about the rise of the Age of Dinosaurs from CCA Education Director and paleontologist Rob Gay. Presented by the Rotary Club of Grand Junction, the 2019 Banff Mountain Film Festival World Tour brings the spirit of outdoor adventure to the Avalon Theatre in Grand Junction on February 23 and 24, 2019. Join us in celebrating everything our National Conservation Areas offer us! Paleontologists work on an excavation in National Conservation Lands. Come join CCA’s paleontologist, Rob Gay, as he discusses the ins and outs of Colorado’s paleontological past. From 220 million year old dinosaur tracks, to killer marine reptiles, to some of the largest animals ever to walk the surface of the Earth, our local public lands have it all! Journey back in time with Rob as he talks about some of the well known fossil discoveries from our area, as well as lesser known gems! Join CCA to #OptOutside in Dominguez-Escalante NCA this Black Friday! Cottonwood Days is a recurring education event that occurs in Gunnison Gorge National Conservation Area as a partnership between CCA, the Bureau of Land Management, and many local partners. For more information, please click here. Have you always wanted to know more about the ancient life that roamed the Grand Valley long before any humans did? Come and join CCA paleontologist, Rob Gay, on a three-day event to track down these prehistoric wonders. Kickoff Halloween week with the CCA and Hot Tomato crews by sporting your best costume at our last 1% event! Bring your lawn chairs, pillows and blankets on Saturday, October 20th for an outdoor feature-length film in the backyard of Best Slope Coffee! Stop by the Hot Tomato on Saturday, October 13th for delicious food, tasty drinks, and live music on the patio featuring Stray Grass! Join CCA as we hike from Bridgeport up the beautiful and historic Big Dominguez Canyon in Dominguez-Escalante National Conservation Area. Participants will meet at the Bridgeport trailhead, then follow our guide across the bridge, along the river, and up the canyon. Along the way we will stop and check out railroad artifacts, historic farming remains, dams, amazing geology, and ancient Native American petroglyphs. The trees should be changing color, so don't forget to bring your cameras as well as your snacks. Come join us on this hike into history! Journey into the past and see where dinosaurs roamed; hike to fossil footprints and see historic archaeological remains from the uranium mining history of the region as well. 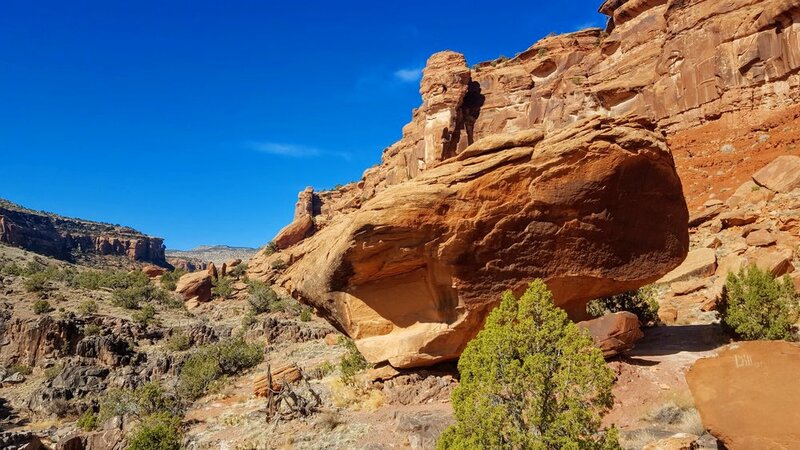 Hike to see ancient fossil footprint and learn about when a Sahara-like environment dominated western Colorado. Hike to a dinosaur skeleton in the rock and learn about the geological history of the area! Stop by the Hot Tomato on Saturday, October 6th for the official launch party of 1% for the Canyons! Raft the river with CCA’s very own paleontologist, Rob Gay, and learn about the billions of years of history written in the rocks. CCA is partnering with The Nature Connection and Delta County Schools Youth Outdoor Network to take Delta County students down the Gunnison River in Dominguez-Escalante National Conservation Area. Join us on Saturday, September 8th from 2-5 pm at Carlson Vineyards to meet the BLM artist-in-residence, Joe Colwell, and enjoy CCA’s delicious new wine, Terra. Joe will be signing copies of his newly published book, Echoes of Time: Reflections on the Mesas and Canyons of the Dominguez-Escalante National Conservation Area. Colorado Canyons Association is excited to offer an educational adventure on the Colorado River!